At the end of 1891, an unexpected event changed Guillaumin's life. He won 100, 000 francs from a premium bond from the Crédit Foncier, bought with the profits from the sale of one of his pictures to Eugène Blot. For the artist, this meant the freedom to travel, to dedicate himself entirely to his art. He resigned from his job at the Paris City Council, found a studio near his house in rue Garancière, near Saint Sulpice, where he had lived since his marriage in 1887, and rejoiced at being able to "get drunk on painting". Finally, he was able to go and discover new horizons, and "paint the sea", without worrying about the time. Two former paintings indicate two short visits, one to Jullouville (Manche) in 1873; the other picture, dated in 1882, shows the Outer Harbour in Dieppe. But it was in 1892 and 1893 that he painted various series of sea views, at Saint-Palais and in the Midi, at Agay. Saint-Palais, a small seaside resort near Royan, on the Atlantic coast, was the subject of about twenty paintings and a number of studies with charcoal and pastels. The inscription at the back of the Thyssen-Bornemisza painting shows how the artist worked from this period onward: he scrupulously noted down on the back of the canvas or on the stretcher the year, the season, the time and even sometimes the weather (TG means temps gris, grey weather), in order to take up the painting again under the same weather conditions and the same light. He would take with him two canvases, usually of different sizes, and when he judged that the light had changed, he turned his easel round to face the opposite side and started working on the other canvas. The representation of a subject under all weather conditions, and his concern for painting a picture always under the same light, motivated him all his life. As an old man, he would still set off at 5 o'clock in the morning to catch the effects of the mist on the Sédelle, one kilometre away from Crozan, having hired the services of a boy from the village to carry his materials, by them too heavy for him. Guillaumin worked without pause and his studio filled up with paintings he would take to exhibitions. Three canvases of Saint-Palais were shown in the retrospective exhibition which the Galeries Durand-Ruel dedicated to him in Paris at the beginning of 1894, among which was the one from the Personnaz collection donated to the Musée de Bayonne (Inv. Pers., n. 73). Guillaumin found inspiration in simple compositions, showing a strong and innate ability to see things from the inside, a characteristic which reveals the man from Central France, solid, with a tempered, though occasionally rough, character. La Pierrière, the Platin rock, the cliff, the low tide, the rising tide are some of the subjects represented in this series of paintings about Saint-Palais. The Low Tide of August 1892 presented in 1913 at the Salon de la Libre Esthétique in Brussels, and even more the Rising Tide of September 92 (sold in Paris, Espace Cardin, 18 June 1973) represent less static and more interesting compositions. 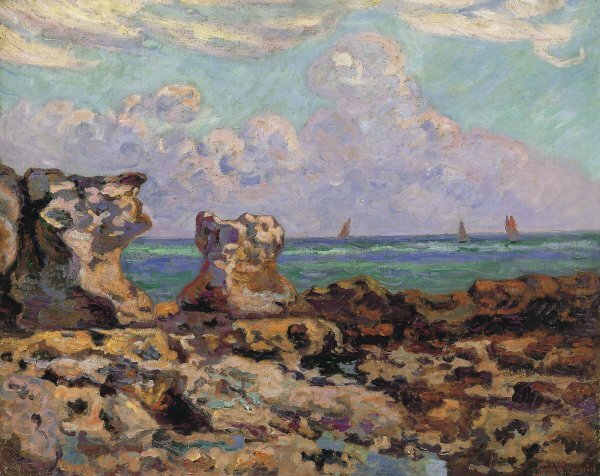 The Saint-Palais from the Carmen Thyssen-Bornemisza Collection is built around two sections, of the same importance, linked by a few elements like the top of the rocks and the sails of the boats. The wide but short brushstrokes sculpt the rock and the darker areas, applying a thicker coat of paint in stronger browns and reds which totally contrast with the areas hit by the light. In the foreground a few touches of blue and pale green serve as a transition to the sea. The sky, with turbulent clouds in the tones of pink and blue, reinforces the impression of intensity of the browns and ochres of the rocks. In that period, Pissarro criticised his choice of palette, expressing his thoughts in a letter to his son Lucien dated 28 December 1893: "Yesterday I saw one of Guillaumin's paintings, it is always the same type of art, if a little less brutal. In spite of all his talent, he is as dark as bitumen. It really is sad to blind oneself on purpose! It is true that he says the same about me. But I know where I'm going, and the reason for doing what I do. But him! After shouting with us against all the Jules Dupré types and all the obscurantists, he has turned his back on the sun, his work is darker than ever: the more he intensifies the tone, the browner he will get".